In the postmortem about Bush's loss to Bill Clinton, called "An Incomplete President," the Times in 1992 brought up his famous "read my lips, no new taxes" pledge. Bush reneged on the promise in 1990, in order to reduce the deficit as part of a budget agreement with congressional Democrats, and the Times hit him for not defending it better and then later apologizing to conservatives for it. "Even when he did something that was both essential and courageous — like reversing his "no new taxes" pledge of 1988 to win a budget agreement in 1990 — he failed to defend it coherently," the board wrote then. "Worse, in that case, he apologized for it." The Times used the same language almost word-for-word upon Bush's death in a piece published Saturday entitled "George H. W. Bush, Public Servant." "Even when he did something that was both courageous and right, like reversing his famous ‘read my lips, no new taxes' pledge at the convention that nominated him in 1988, he failed to defend the reversal coherently," the board wrote. "Worse, in that case, he apologized for it." 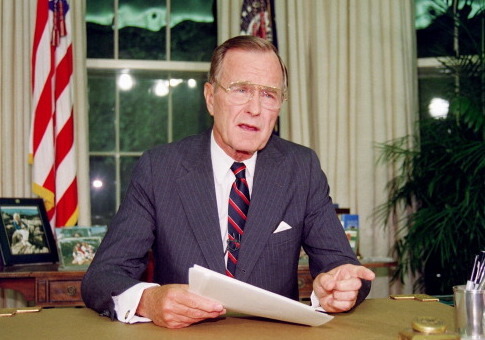 1992: Angry Republicans point fingers in every direction to account for President Bush's defeat. Some blame an unfortunate turn in the business cycle from which no President could have escaped. Others blame bad advice from passive economic strategists, the nasty convention in Houston, his unaccountably late and lame campaign. All true, but the main reason for George Bush's precipitous fall from political grace was George Bush himself. 2018: A Times editorial after his defeat called Mr. Bush "an incomplete president" — good at some things but clumsy at others. Fate had dealt him one of the strongest hands in foreign affairs ever awarded a new president, and for the most part he played that hand cleverly and energetically. The Washington Free Beacon reached out to the New York Times for comment and hasn't heard back. This entry was posted in Politics and tagged George H.W. Bush, Media, New York Times. Bookmark the permalink.